Indonesia does not have a law that specifically regulates matters concerning financial reporting requirements. The requirement to have a bookkeeping system that is in compliance with Indonesian accounting services standards is found in various laws and regulations, including the Limited Liability Company Law, the Tax laws and their implementing regulations. However, timely and accurate financial information is crucial for a company to maintain a competitive advantage in today’s dynamic business environment. Paul Hype Page & Co, a public accounting firm, full practicing member of ICPAS, provide a full range of computerised accounting services and book-keeping services for our clients. We are a Singapore certified public accounting company and has finally expanded to Indonesia. Over the past 10 years, we have gained vast experience in accounting services as well as auditing services. Accounting refers to the bookkeeping system that is in compliance with Indonesian accounting standards is found in various laws and regulations, including the Limited Liability Company Law, the Tax laws and their implementing regulations. In every company, there will be many transactions. For both expenses and incomes, all data must be collected and analysed, to determine the financial flow and development of your company. Auditing is important to know the mistakes made during the stated period. Our audit professionals provide a range of independent audit services based on a strong knowledge of accounting principles. These are complemented by an appropriate knowledge of business systems, processes and controls. An auditing services adds credibility to information provided to shareholders. It provides assurance to investors and other providers of finance who are able to make their decisions in a safe environment, with confidence. Safety and confidence reduce the cost of capital and make companies competitive and profitable. 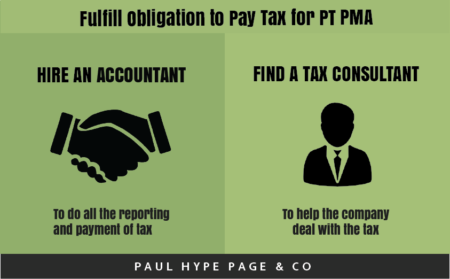 It is compulsory for all PT PMA companies in Indonesia to pay taxes and report the company’s financial status regularly. Many of Indonesians’ taxes that should be paid by PT PMA are similar to what stakeholders should pay in different countries. Among them are monthly and annually withholding taxes, monthly and annually income taxes, Value Added Tax (VAT), Luxury Goods Sales Tax (LGST) – if any, along with the company investment plan. Those taxes should be paid in the local tax office, where the company’s office is located. 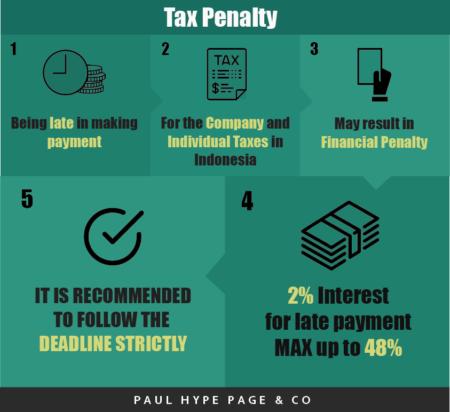 When a PT PMA has a domicile in the Indonesian territory, it will be treated as Indonesian tax resident, so that the company has the obligation as a resident taxpayer. The taxation regulation in Indonesia incorporates both a self-assessment system and a withholding tax system. Some taxes should be paid monthly and others are required to be filed annually. The company’s taxes should be reported monthly include Corporate Income Tax, Employee Withholding Tax, Other Withholding Taxes, as well as VAT and LGST. These taxes are usually paid before the 10th day of the following month for the withholding taxes and before the 15th of the following month for the Corporate Income Tax. The first three taxes must be filed or reported before the 20th of the following month, whereas for VAT and LGST, they have to be reported at the end of the following month. For taxes that should be paid annually, they include Corporate Income Tax, Individual Income Tax, and Land and Building Tax (for both the office and the factory or warehouse – if any). The deadline for the first two is before filing the tax return, and the deadline for the last one is 6 months after receiving a tax notification letter from the tax office. All taxes should be paid regionally. Being late in making payment for the company taxes and individual taxes in Indonesia may result in financial penalty. The tax payer should pay an interest of 2% per month for late payment. The maximum interest that should be paid by the tax payers is 48%. Considering the amount of extra money that you have to spend for the fine, it is recommended to follow the deadline strictly. Statutory audit not only requires the review of financial information and application of regulation, but there also needs to be support; support for the accountants completing the compliance, the trustee and the members. Our team of specialists can be relied on to not only identify issues but to also provide assistance and guidance on rectification and compliance.